Manitoba Important Bird Area Program Assistant, Marshall Birch gives us the lowdown on day 2 of our Southwestern Mixed-grass Prairie IBA visit. Up at five on an overcast and slightly rainy morning, and after a granola bar breakfast and a cup of coffee we were off to get some early birding done before our scheduled meeting with local landowners at eight. 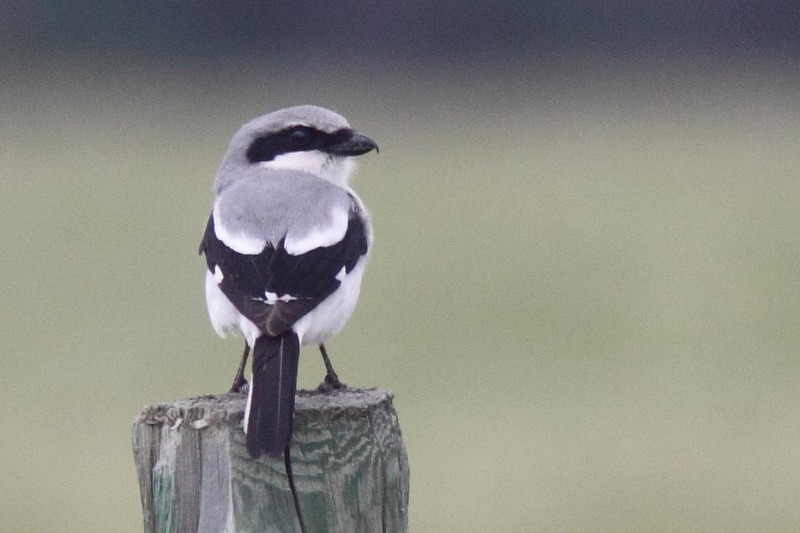 We had heard tell of an area that was supposed to have nesting Loggerhead Shrikes, one of the threatened bird species of the area. On the way we ran into Garry Budyk, who was in the middle of doing his Breeding Bird Survey (to know more about Garry, see his photography website http://imagesofmanitoba.shawwebspace.ca/). He didn’t have much time to stop and chat, but he agreed to meet up with us later. A little further down the road we did indeed see a pair a Loggerhead Shrikes perched in a group of shrubs not far off the highway. This was a satisfying moment for myself, as last time I was in the area I thought every Eastern Kingbird (a common species in the area) could be a Loggerhead Shrike, only to be disappointed time and time again. Already a good start. 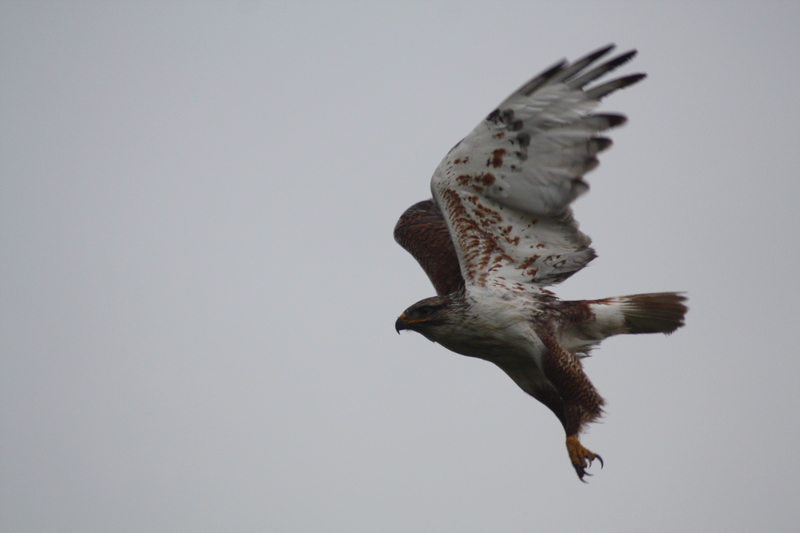 We continued on to scope out the nest of a Ferruginous Hawk, North America’s largest hawk, and also a threatened species in Canada. It took us a little bit to discover one perched low on the ground, not far from the nest, but in the mean time we had a chance to spot some other key species: Chestnut-collared Longspur, of which we saw eight all day; Le Conte’s, Grasshopper, and Savannah Sparrow; and several Bobolinks, which were beginning to feel about as rare and special as Red-winged Blackbirds. With grassland species such as these, it is not so easy to pick out where one might be in the expansive surrounding pastureland, so they are most often identified through song and sighted afterwards. 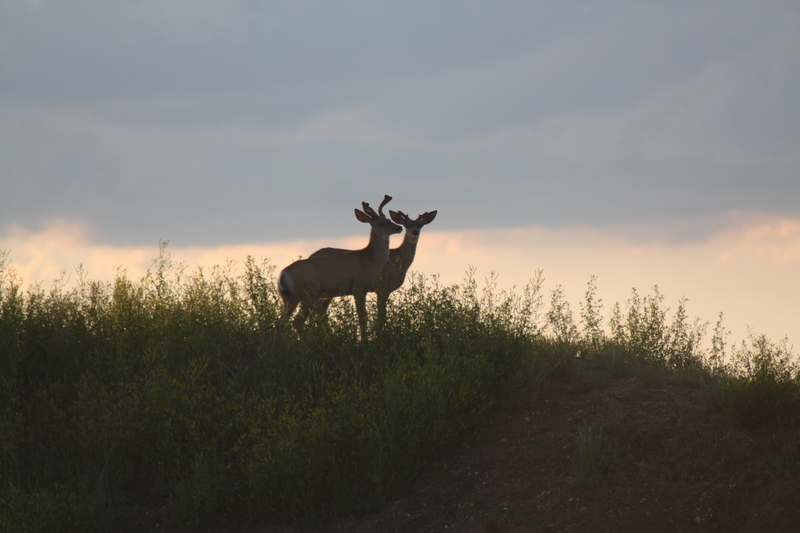 Generally you won’t spot these species on a drive-by – it’s best to stop and listen for them, and often times when searching for one species you’ll find another. After we spotted the Ferruginous Hawk it shifted to a perch atop a hydro pole where we not only had a great glimpse and photo opportunities, but also noticed a second Ferruginous on the ground in a pasture near the pole. Things were going well, but it was about time for us to meet up with the landowners. We parked along a roadside I’ll never be able to find again or locate on a map, and scoped out the species in the area as we waited for the eight or so people who had braved the poor weather to join us. Various sparrows and warblers, Bobolinks, Western Meadowlarks, Brown-headed Cowbirds, Red-winged and Yellow-headed Blackbirds, Eastern and Western Kingbirds, and American Goldfinches were easy to see and hear along the roadside and adjacent pastures. As people arrived, we handed out species references sheets that I had prepared, introduced ourselves, and explained what we were doing. Though this section of the outing only involved a short walk down a country road, it proved to be a rich birding experience, with all the above-mentioned species identified, along with Baltimore and Orchard Orioles, Wilson’s Snipe, Killdeer, Willet, Lark Sparrow, and a small array of waterfowl. The highlight perhaps was a pair of juvenile Great Horned Owls, sitting low in a cluster of trees, attempting what may have been some of their first flights. Following this we dined upon muffins and fruit punch before taking the group back to see the Ferruginous Hawk – successfully locating the hawk as well as the majority of other species we’d seen in the area earlier. Garry met up with us here and set up his scope so everyone could get a good view of the hawk as well as a Grasshopper and Clay-coloured Sparrow. By this time is was getting a bit past noon and we were all a bit tired and hungry for a good meal. The group of locals headed home and we were promised one more stop before heading towards fine dining at Melita’s elegant Chicken Chef. The area in question was a bridge-crossing at a wooded bend in the Antler River – we had been tipped off that there was a Lazuli Bunting living around there and decided to see if we could find it. It took a bit, but a little persistence paid off and we heard then saw the Lazuli Bunting, as well as a few flycatchers, and several American Goldfinches. For most normal people this would be time to stop and refresh but not for us avid birders. Oh no! Tim had some gaps in his lifelist which needed filling before lunch so off we went to look for them. First up to the famous Section 29 and the shy and rare Baird’s Sparrow. These little guys charmed us all with their tuneful song. Chestnut-collared Longspurs aplenty greeted us as well in this area. Gainsborough Creek was next on the list, the place to pick up Willow Flycatchers, not the most inspiring bird on our journeys. Garry required his first for the year Rough-winged Swallow but unfortunately we missed out on this occasion. A Cuckoo was also heard, and as many a cuckoo clock has in the past, it signaled time for lunch, via a few more unsuccessful attempts to find Rough-winged Swallow, and then back to Tilston for a nap. After an invigorating fifteen minute nap, I was back up with another cup of coffee and another granola bar. Ken De Smet, a biologist and avid birder with great familiarity with the area, had joined, and the powers that be were setting plans for the evening and the following morning. Our primary obligations for the day were out of the way, so we had some time to explore around, looking for birds to tick off on our year or life lists. At this point we had a good team of experts in the area too, so we were well-prepared to hunt down what we needed. In two vehicles we were lead down roads, primarily of gravel or lesser quality, spotting birds on every side. 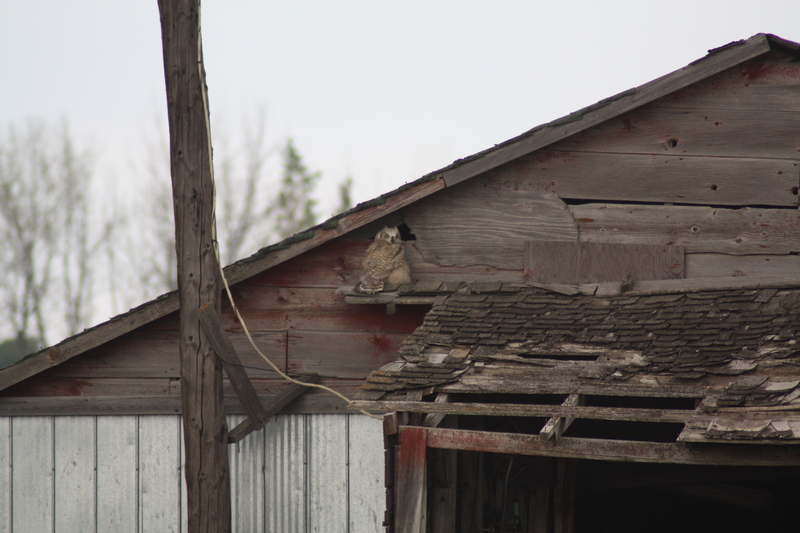 Upland Sandpipers and Wilson’s Snipes were common sights on fence posts, with Northern Harriers, Red-tailed Hawks, and Swainson’s Hawks atop hydro poles or soaring through the sky. We stopped by a few abandoned buildings inhabited by Say’s Phoebes, Barn Swallows, and Great Horned Owls. 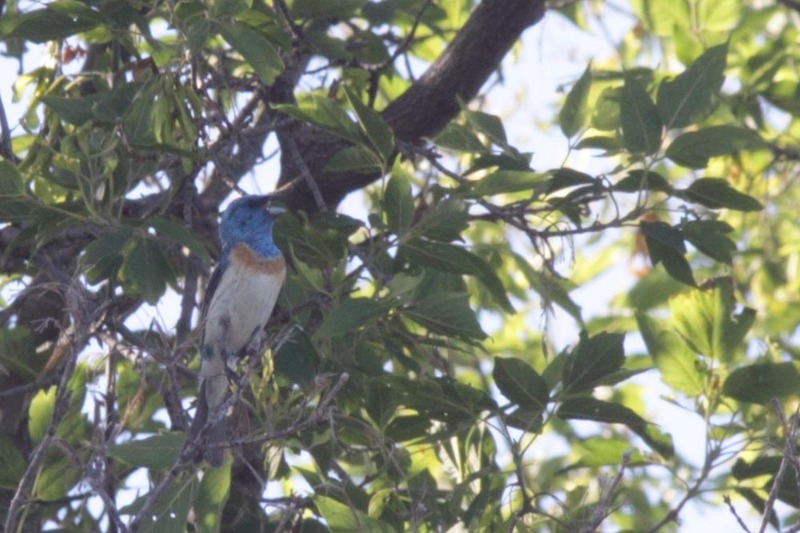 Near a marshy wooded area, alongside fields populated primarily with oil derricks, we were able to locate Mountain and Eastern Bluebirds, as well as a Wild Turkey. Each wetland we passed had it’s own assortment of ducks, Coots, Avocets, Phalaropes, and Terns. Open fields offered sightings of Sharp-tailed Grouse, Blackbirds, Meadowlarks, Wrens, and Sparrows of all kinds, while wooded areas revealed Flickers, Sapsuckers, Woodpeckers, Warblers, Goldfinches, Flycatchers, and Orioles. We stopped by a few bridges teeming with Cliff and Tree Swallows, along with the occasional Bank or (finally) Rough-winged Swallow. While virtually every second bird was a new and exciting experience for myself, the rest of the group had more refined tastes, and only the best would do, so it was off to find more of the real prizes: the Sprague’s Pipit, the Chestnut-collared Longspur, and the Baird’s Sparrow. We headed to a mostly overgrown path between two pastures which was the perfect habitat for all of these species-at-risk. I had been here the previous year with little success, though this time I was with a whole team of skilled professionals, and before long all three species had been identified, along with a Nelson’s Sparrow, a Red-tailed Hawk, a Northern Harrier, Bobolinks, Grasshopper and Clay-coloured Sparrows, what appeared to be a Short-eared Owl in the distance, and a couple of Mule Deer. 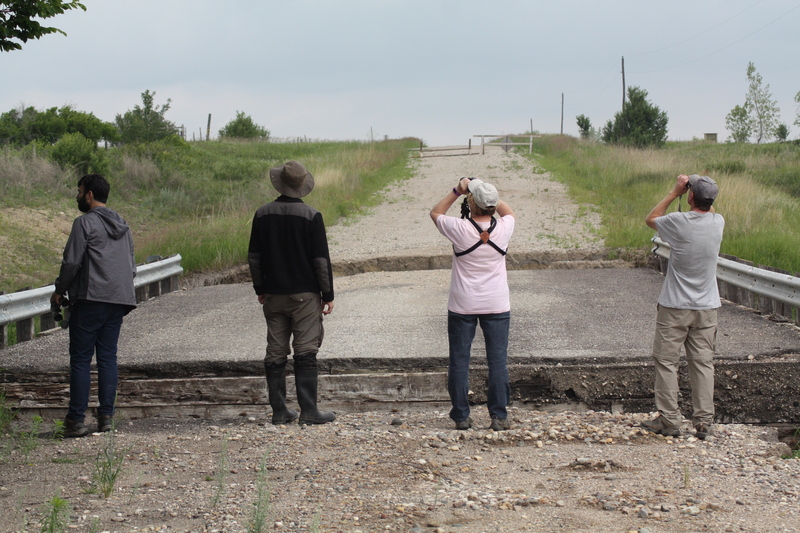 The mosquitoes got bad pretty quick, and having found all the birds we were aiming at, we headed back to Tilston. By the time we were done discussing our plans for the following morning it was around eleven, and we were set to get started by five, so it was bed time for us.